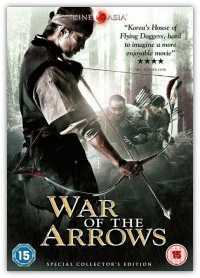 War of the Arrows (RR: Choejongbyeonggi Hwal), alternately titled Arrow: The Ultimate Weapon, is a 2011 South Korean period action film starring Park Hae-il, Ryu Seung-ryong and Moon Chae-won. Set after the Second Manchu invasion of Korea, the film is about an archer who risks his life to save his sister from slavery under Prince Dorgon’s rule. Praised by critics for its fast pacing and combat sequences, the film drew an audience of 7.48 million, making it the highest grossing Korean film of 2011. It was also honored at the 48th Grand Bell Awards and the 32nd Blue Dragon Film Awards, including Best Actor for Park, Best Supporting Actor for Ryu, and Best New Actress for Moon.